At Camp Bow Wow Monument, we believe every dog should have a loving fur-ever home. We work closely with local shelters and rescues to help with their adoption efforts, and often have foster dogs staying at Camp. These dogs get to play all day with other Campers, snooze the night away in individual Cabins, and get lots of love and attention from our Certified Camp Counselors®. Black Forest Animal Sanctuary |Website | Contact Them! Mile High Husky Rescue | Website | Contact Them! North Star Husky Rescue | Website | Contact Them! RezDawg Rescue | Website | Contact Them! Waggin' Tails Canine Rescue | Website | Contact Them! Big Dogs Huge Paws | Website | Contact Them! Personality: This is Davina! This 11 month old, blue brindle beauty is pretty close to perfect if you ask us. 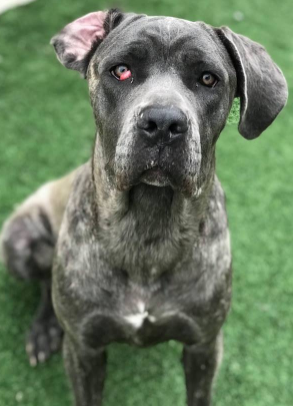 While she may be an adolescent Cane Corso, which is not the breed or age for just anyone, she has a lot going for sure. She is house trained, crate trained, leash trained, knows sit, lay down, house, no, and leave it. Davina also gets along well with other dogs, cats, and kids, although she is a bit shy initially when it comes to strangers. Also shy around men. She is a typical puppy who will need structure, boundaries, plenty of proper chew toys and regular exercise to keep her from chewing on things she shouldn't. She loves a good car rides, enjoys playing at doggie day care, and even likes baths. Davina is a good guard dog who will bark to alert. Adoption Information: Giant Breed Experienced Homes Only. We are fostering his with Big Dog Huge Paw! Contact them or Leona at Camp Bow Wow Monument if you interested in adopting this amazing girl!